Oceanic and Atmospheric Research (OAR)—or “NOAA Research”—provides the research foundation for understanding the complex systems that support our planet. Working in partnership with other organizational units of the National Oceanic and Atmospheric Administration, a bureau of the Department of Commerce, NOAA Research enables better forecasts, earlier warnings for natural disasters, and a greater understanding of the Earth. Our role is to provide unbiased science to better manage the environment, nationally, and globally. 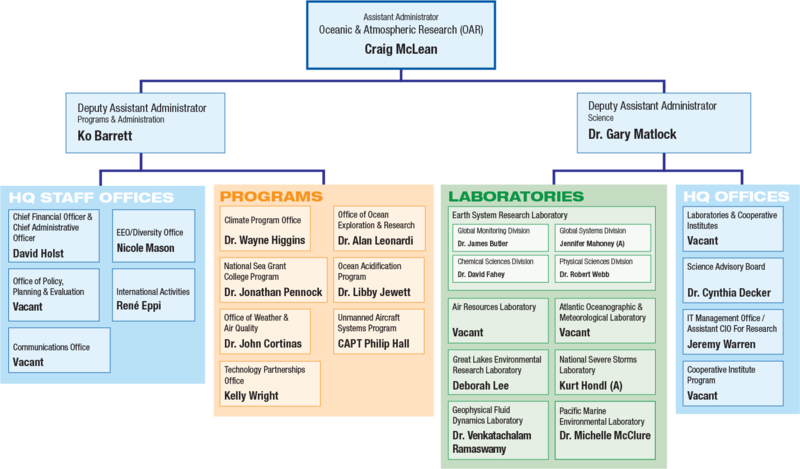 Craig McLean is the Assistant Administrator for Oceanic and Atmospheric Research. He also previously served as NOAA's acting Chief Scientist. He is responsible for NOAA’s research enterprise including a network of research laboratories and programs including the Climate Program, National Sea Grant, Ocean Exploration, and Weather Research. Internationally, Mr. McLean serves as the U.S. Representative to the Intergovernmental Oceanographic Commission (IOC), and as the Co-chair of the U.S. European Union Marine Working Group, and in the US-Canada-EU North Atlantic Ocean Research Alliance under the Galway Statement. Mr. McLean has previously served as NOAA’s Acting Chief Scientist, Acting Deputy Assistant Administrator of the National Ocean Service, and was the founding Director of OAR’s Office of Ocean Exploration and Research and served in uniform for nearly 25 years in NOAA's Commissioned Corps, attaining the rank of Captain. Mr. McLean served aboard hydrographic, oceanographic, and fisheries research ships. Craig led NOAA's innovation and planning for the Smithsonian Institution's Sant Ocean Hall, and achieved a National Ocean Action Plan goal of securing a permanent, dedicated US ship for the ocean exploration, the NOAA Ship Okeanos Explorer. Craig is also an attorney and has practiced marine resource law for NOAA. Mr. McLean is a Fellow of the Explorers Club, the Marine Technology Society, a 250th Anniversary Fellow of Rutgers University, and a past-president of the Sea-Space Symposium. Ms. Ko Barrett is serving as the Deputy Assistant Administrator for Programs and Administration for Oceanic and Atmospheric Research. She comes to this position from seven years of serving as Deputy Director of OAR’s Climate Program Office (CPO), which oversees and coordinates climate activities across NOAA addressing climate observations and monitoring, research and modeling, and the development and delivery of climate services. For over fifteen years, Ms. Barrett has represented the U.S. on delegations charged with negotiating and adopting scientific assessments undertaken by the Intergovernmental Panel on Climate Change (IPCC). She is widely recognized as an expert on climate policy, particularly on issues related to climate impacts and ways to help society to adapt. She has won multiple awards for her contributions to both NOAA and the nation, notably the U.S. Department of State Meritorious Honor Award in 2011, the NOAA Administrator’s Award in 2010, and in 2007, she shared in the Nobel Peace Prize granted to members of the IPCC. Prior to joining NOAA in 2005, Ms. Barrett was the Director of the Global Climate Change program at USAID, overseeing climate activities in over 40 countries. While at USAID, she initiated its Vulnerability and Adaptation Program. Ms. Barrett has a B.S. degree in Environmental Science and was named Distinguished University Scholar as well as Distinguished Research Scholar through Sigma Xi Scientific Research Society from the University of North Carolina in Asheville. Dr. Gary Matlock is serving as the Deputy Assistant Administrator for Science for Oceanic and Atmospheric Research. He also is the Director of the Office of Policy, Planning, and Evaluation in OAR. He has served in that capacity since January 2011 and is responsible for guiding and evaluation NOAA’s research and development portfolio. Prior to arriving at OAR, he spent 18 years working in three other NOAA Line Offices directing ecological and fisheries related research and overseeing the agency’s national and international fisheries management programs. Dr. Matlock began his federal career with NMFS in 1992 as the Director of Field Operations in the Southwest Region where he became the Acting Regional Director after 3 months. During his year’s tenure in these positions, he was involved in the management of domestic and international fisheries along the west coast of the United States and throughout the southern Pacific Ocean. In 1994 he became the Program Management Officer for the National Marine Fisheries Service (NMFS) in Silver Spring, Maryland where he oversaw the day-to-day operations of the agency, expanding his fisheries management experience domestically and internationally to the north Pacific Ocean and the Atlantic Ocean. In 2000, he became the Director of the National Centers for Coastal Ocean Science in the National Ocean Service (NOS) where he was responsible for directing and managing an ecosystem science agenda that provides science to support the Ocean’s Service place-based management mission. He also served as the Acting Director of NOAA’s Program Analysis and Evaluation (PAE) office and as Acting Assistant Administrator of the NOAA’s Policy, Planning, and Integration (PPI) Office. Prior to joining NMFS, Dr. Matlock spent his fisheries career with the Texas Parks and Wildlife Department (TPWD). His dissertation provided a basis for the management of the red drum fishery in Texas. He began as a fisheries biologist responsible for developing a monitoring program for adult finfish in Texas bays and left TPWD after having been the Director of Fisheries of TPWD. During his tenure with TPWD he earned his Ph.D. in Wildlife and Fisheries Sciences at Texas A&M University and conducted and published the results of research in the scientific literature on many fisheries management and aquaculture topics including those involved with biology, sociology, and economics. Throughout his career, he has successfully led an effort to base fisheries management decisions on scientific information instead of political whim or personal opinions. This goal has taken him to all levels of the judicial system as an expert witness on behalf of science and fisheries management decisions, including the U.S. Supreme Court where a NMFS decision concerning native American tribal treaty rights and salmon on the west coast was upheld. He has and continues to publish in the national and international scientific literature on the biological, ecological, social, and economic aspects of fisheries science and management. support the Nation’s commerce with information for safe, efficient and environmentally sound transportation. prepare scientific assessments and information products to enhance public education and guide governmental action. Research plans and products are developed in partnership with academia and other federal agencies, and are peer-reviewed and widely distributed. A high premium is placed on external collaboration both domestically and internationally. In addition, personnel management practices of hiring, promotion, and awards are based on demonstrable capability through internal and external peer assessment. Peer review, collaboration, and partnerships ensure that NOAA’s research is of the highest quality and remains focused on critical issues. NOAA is a world leader in environmental science today and is well positioned and organized to provide the sound scientific research policy-makers will always need. OAR is updating its Strategic Plan, which will better align our planning activities with the Goals and Objectives outlined in NOAA's Next Generation Strategic Plan. The new strategic plan will guide our future research and resource decisions to foster an innovative and integrated research enterprise dedicated to advancing our understanding of the oceans and atmosphere. We will post the final document on this page when complete. In addition, the NOAA Research Council is working to develop the next NOAA 5-Year Research and Development Plan following the FY13-17 iteration. As with the OAR Strategic Plan, this 5-year plan will be closely tied to NOAA's Strategic Plan, describing how we will integrate our research and development activities across each of NOAA's Line Offices in support of NOAA's service and stewardship mission. You can provide input and follow the development of this plan on the NOAA Research Council website.